Finding a property in India can be tricky and tedious at times, but not if you do it the right way. 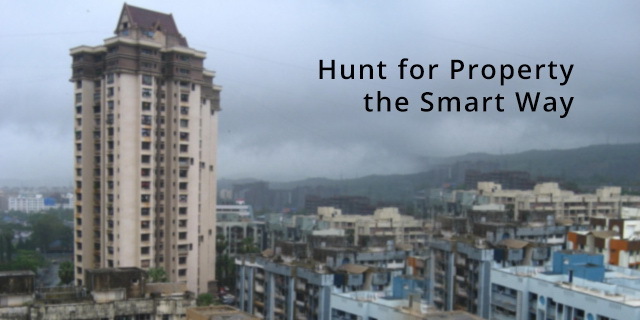 Here are ways to hunt for a rental or buy property in India the smart way. Property in India is always a hot topic among the home seekers. The sky-rocketing prices in the metros, the recent hike in stamp duty, the demand for the black component, titles and clearances, the builders track record and such issues result in confusion and hard work to hunt for property. To top it up our busy work lives do not permit us to keep searching endlessly and visiting every property our ‘real estate agents’ show and at times these agents try to hard sell some properties that we do not want to buy or rent and it becomes added headache to answer them. So how do you hunt for property the smart way? If you are trying to rent or buy property in India, then the following will certainly help to cut down the time and efforts required to hunt for property. From your side the first thing you should do when you decide to buy or rent a property in India is to decide a budget. And this budget need not be what others suggest or real estate agents recommend, it should be what you can really afford. From my personal experience, I can vouch that there are good properties available in every budget, you need to at times compromise a few specifics, as in maybe move a few kilometres away from your current location, or let go of an amenity like a gym or a swimming pool, but you will get it in your budget, as long as the budget is reasonable. Also while deciding on the budget remember to not only include the actual cost but also the EMIs of your home loan, stamp duty, registration, society transfer fees, agent’s commission if you are buying and in case of rent the security deposit and the registration fees along with the agent’s commission and actual rent. The second factor is to zero in on possible areas where you wish to buy property in India. It always helps to be clear of the possible locations where in you would like to buy a property. For instance if you are in Mumbai and plan to buy a property in Navi Mumbai, then it will help to be sure as to what areas in Navi Mumbai would you like to hunt for property, and also cross check it with the budget you have in mind. The other factor is the daily commute you would need to make from your home to the workplace. You need to be very clear of the possible mode of transport and the travel time it will take to reach either destination. What all should the property consist of in terms of within the premises and around it. If you have kids, you would look at schools nearby; you would need provision and grocery stores too, maybe temples and banks whereas things like malls etc can be a few kilometres away as they are not daily essentials. Be clear about the specifics before you plan to start your search for property in India. Also when you approach the real estate agents, you would be better off with a clear set of budget, area and your specific requirements. For instance he may have a lot of properties in an area which is surrounded by commercial spaces, but you may need a proper residential locality, so mentioning that saves his and yours time. Pretty old and useful Sites like Makaan, Magicbricks, 99acres and some other newly launched real estate sites help a lot to streamline your search, contact the concerned persons and will play a good role in hunting your property the smart way. They also have agents that are registered with them and hence they will have some credibility. All the above points will help you in your search on these sites as they allow you to search for properties of various kinds based on various search filters; you can sort and look for properties in your budget, between a particular area and with specifics of how many rooms, square feet, amenities etc you want. If you are averse to the idea of contacting an agent, then you can even filter out those properties which are posted by agents and only see the ones posted by owners or builders. Also Read: Financial First Aid Kit - Do you have these 5 very Important details in Place? Similar to the online sites, these sites especially Magicbricks, have mobile apps that have the same features and added functions like calling from the app itself and so on, to really ease your property hunt on the go. You can even mark the properties you have shortlisted and check it later. This also saves time since even when you do not have access to a computer your mobile can still help you hunt for property the smart way. Both, sites and apps have the location of the properties listed too, so you can check whether it is in desired area or locality and only then go ahead and make the call. Do not stick to only one agent when you are looking for property in India. Once you have shortlisted your properties by using the sites or the apps you would contact the person who posted the ad. Invariably you will find agents handling them since most of the sellers too wouldn’t want to go through the hassles of looking for buyers. When you call them up, mention the specific property you are looking at and would like to visit. Also make sure to tell them to show you a few more similar properties when you visit so you can save time later by not going in the same area to see another property. Confirm before you leave to check the properties, since many a times it happens that the agent may call you but the owners are not available at that time or the keys are not available, so you can’t see the property and have wasted your time. As you go and visit multiple properties, make a note of the ones you liked and the one’s you rejected too. The rejected properties should be noted so that you do not end up wasting your time looking at the same property again by some different agent. When you hunt for property in India, in a specific area, chances are that same property is available with multiple agents in that area. You contacted one of them for a certain property and some other for another property. So while looking at nearby properties, there are chances that you would end up going to the same property that you have already seen. Always confirm the location of the property with the agent, before you plan to go. Tell the agent that you have seen various properties from different agents so you do not want to repeat the ones you have gone through. Whenever you go for a property hunt, make sure to check if the property has the required titles cleared like Society registration, Clearance Certificate, Occupancy Certificate etc. Do they have regular AGM meetings in the society, what is their policy on pets in case you have pets, are kids allowed to play in the compound, parking spaces etc. Before you finalize the property, make sure to have a word with the chairman or secretary of the society and ask for any doubts you may have. Also you can speak to the neighbours about the area and the home itself in case you need any information. Once you have finalized the property and are satisfied with all the documents and all other requirements are met (only after all that), you can sit down to discuss the payment terms. There will be a token amount, which can vary from 10% of the total cost of the property to up to 30% or more. This is the payment after which the seller won’t hunt for buyers and proceed with a deal with you. You need to arrive at a final price for the property before the token is exchanged. Also the payment terms, the amount of loan you have, the speed with which the payments can be settled and the possession date are all to be discussed and should be drafted in writing in an MOU while exchanging the token. This will save a lot of hassles later and avoid any unpleasant payment surprises to spring up later. Following the above steps will make sure your hunt for property is as hassle free and less time consuming as possible. Buying property in India or even renting it is not a cake walk but if one makes sure to keep the above in mind it can be very simplified.